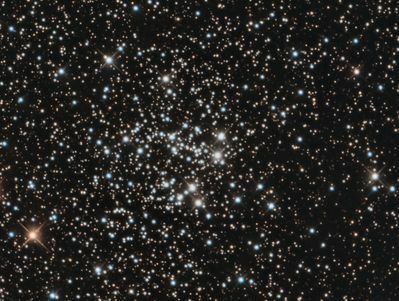 The open cluster NGC 663 is found in the constellation Cassiopeia. NGC 663 contains a significant number of Be stars (spectral class B stars showing emission lines in their spectra). The distance from us is on the order of 2,100 parsecs (6850 light years). The image is a total of 5 hrs 20 min exposure taken with a 12.5” RCOS f/9 @ f/6 (Astro-Physics CCDT67) and SBIG STF8300m camera on a Paramount ME in Mayhill, NM on the nights of 28 Nov and 3 Dec, 2018 (6 x 1200 sec R; 5 x 1200 sec G & B; 24 darks; 128 bias; 128 flats). Processed in PixInsight 1.8.5.1353 Ripley (x64).